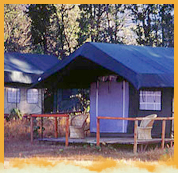 Camp Forktail Creek is situated in the midst of a dense Sal forest on the north-eastern periphery of Corbett Tiger Reserve. Corbett National Park is India's first and one of her finest National Park. Owing to it's geographic location, Corbett supports a rich variety of habitats and is extremely rich in bio-diversity. Camp Forktail Creek offers one a great "jungle" experience in the land Jim Corbett once roamed. Situated in the village of Bhakrakot, camp is surrounded by mixed deciduous forests that are extremely rich in wildlife and bird-life. Hikes in these forests are very rewarding for bird watching, apart from the pleasure of sighting animals on foot. Six mude house and three spacious safari tents on raised wooden floors are well spaced for privacy. Each tent has a deck and a fully functional toilet. The furnishings in each tent include a chest of drawers with a dressing mirror, twin beds with soft duvets, side tables, deck chairs and a luggage table. 2 mud huts, specially created by local craftsmen have recently replaced two of our tents. Each have thick thatched roofs, a private verandah and attached toilets. Furnishings are similar to the tents. "The Thatch", a large, tall wooden structure with a thatched roof. This houses the library, the lounge area and the dining area with the buffet. An ancient Banyan tree with ample space in its shadow for hammocks and casual seating. A campfire area with a barbeque pit for those cold winters evenings. "The Dhaba" or tea point, a hot favorite amongst all, is where hot tea or coffee is brewed in a fashion typical to this region. 'The Acre' a hideout amidst dense lantana bushes for bird watching or relaxing in the hammocks/ rugs placed there. * Full day game drives / half day game drives in open 4WD safari vehicles with professional naturalists. * Game viewing on elephant back inside the National Park. * Guided jungle hikes with professional and knowledgeable naturalists. * Visits to a typical Kumaoni hamlet or temporary settlements of nomadic tribes. * Fishing for the mighty mahaseer on the Ramganga River. * Rafting on the Kosi River during the monsoon months. * Extended trips for three to eight days on elephant back. * Overnight hikes in the surrounding jungles. * Overnight trips into he National Park. * Jeep safaris to old forest bungalows scattered over the Kumaon Himalayas. all meals; a lavish buffet spread for breakfast, lunch and dinner. accommodation for 2 night and 03 days package. Escorted hikes into the surrounding jungles with a trained professional from Camp.